Auditions for the performance track are on Monday, April 15 from 5-9 p.m.
Audition date is Monday, April 15 from 5-9 p.m. Program culminates in a public performance of Disaster! The Youth Repertory Theatre program is the only professional training program for student actors and design technicians in the Pikes Peak region. The Fine Arts Center Theatre Company offers students interested in pursuing careers in performance and/or design & technical theatre a five- week intensive training program. The serious theater student will receive comprehensive, hands-on training through a rigorous class schedule that combines master classes along with a structured rehearsal period and performance experiences. The performance and technical tracks of the program have been designed for both new and returning students in order to develop basic skills as well as foster continual learning and growth. All students will work with a qualified and professional teaching staff, choreographers, directors, and designers- all of whom currently work extensively throughout the United States. This includes returning director Nathan Halvorson and the staff of the Fine Arts Center Theatre Company. The program begins June 24 and runs through July 28, 2019. A complete calendar will be distributed to students upon receipt of their registration materials. Classes, workshops, and rehearsals are currently scheduled from 9 a.m. to 5 p.m. Monday through Friday for the first three weeks of the program. Lunch break is from 12-1 p.m. Students provide their own meals. Beginning July 17, the schedule will consist of dress rehearsals and performances. During this time the schedule will shift to afternoon through evening 1-9 p.m.
All schedule conflicts must be approved prior to registration. We expect all students to be present and prepared to begin on time for all classes, rehearsals and performances. The intensive nature of this program does not allow for excessive absences. The performance track at Youth Repertory Theatre has a long history of preparing students for an acting career. Some of our alumni have received full scholarships to college (Northwestern University, North Carolina School of the Arts, etc.) 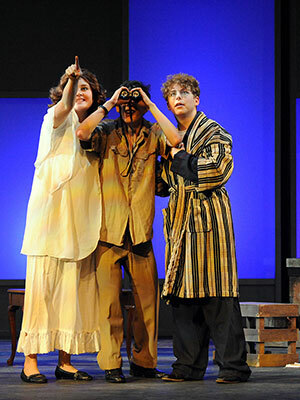 and many have been seen on the Fine Arts Center stage in our Mainstage productions. Our qualified and professional teaching staff members are successful in their chosen field and are able to communicate their experiences to others. The performance program combines classes, studio work, and labs with individual attention and mentorship from these working professionals. Students are also able to experience rehearsals and performances under the guidance of the staff. We believe that this kind of immersive training in various skills and techniques along with a professionally directed performance experience prepares students to head into the competitive marketplace. For the performance track auditions, you will need to bring a headshot and resume and prepare a 32 bar selection of a musical theatre song with sheet music for the accompanist and a short (under two-minute) monologue, both memorized. The Youth Rep Technical Theatre program provides students the opportunity to be trained by working professionals for a career in live theatre. It offers students an intensive, vocational program of study in technical theatre. Students will be able to immediately utilize the skills they learn as they design elements of the show that is performed at the end of the program. As part of the program’s core, students are in direct contact with the technical theatre instructors throughout the day. We keep the number of students in the program low so all students have ample “face time” with the instructors, as well as the opportunity to learn through a master/apprentice approach to training. Introductory and advanced studies in the theory and practice of technical theatre are offered. Both are designed to challenge creativity, encourage development of problem solving skills, and prepare students for a career in the technical crafts of the entertainment industry. Upon completion of the program, students will have the technical theatre skills necessary to participate as paid interns for upcoming Fine Arts Center Theatre Company main stage productions. Once your application has been reviewed, you will be contacted by our Production Manager, Chris Sheley, who will set up an appointment time for you to come to the FAC for an interview. After the interview process has been completed, students will be contacted promptly regarding their acceptance. All returning students must submit a resume with their application. It’s 1979, and New York’s hottest A-listers are lining up for the opening of a floating casino and discotheque. Also attending is a faded disco star, a nightclub singer with her eleven-year-old twins, a disaster expert, a feminist reporter, an older couple with a secret, a pair of young guys on the prowl, an untrustworthy businessman, and a nun with a gambling addiction. What begins as a night of boogie fever quickly changes to panic as the ship succumbs to multiple disasters, such as earthquakes, tidal waves, and infernos. As the night turns into day, everyone struggles to survive and, quite possibly, repair the love that they’ve lost … or at least escape the killer rats. Audiences and critics are wild for this hilarious homage to the era of bell-bottoms, platform shoes and the hustle. With larger-than-life characters, snappy dialogue, and some of the most recognizable songs of the ’70s (Knock on Wood, Hooked on a Feeling, Sky High, and Hot Stuff, to name a few), Disaster! will have you dancing in your seats and rolling in the aisles.